We have taken the hassle out of getting screened and created a simple, three step process. We are able to provide confidential, affordable, and fast screenings for sexually transmitted diseases to patients in the Washington , area. With infection rates like these, it's important to get checked regularly. Let us help you protect your health and well-being. Why choose us for STD testing in Washington ? Getting tested with us is easy, fast, and convenient. Our network serves the Washington area, ensuring that there is a location near you. Your STD testing Washington lab visit will only take 15 minutes and does not involve any swabs or exams. Plus, our services have among the lowest std lab test prices, ensuring you'll get your peace of mind at a price you'll love. We work which are considered some of the top diagnostic centers available. The STD testing Washington lab visit will only take 15 minutes and you don't have to make an appointment. 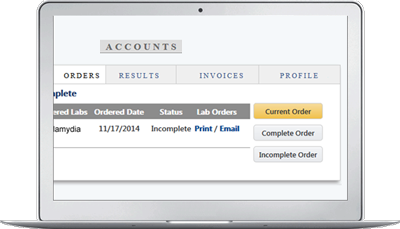 Simply show up with your lab order whenever you are available during operating hours. We strictly adhere to state and federal laws regarding your privacy, including HIPAA. We will never release your information without your consent and take many steps to ensure it does not fall into the wrong hands. Our network laboratories, use the most advanced diagnostic screening methods available, so you can trust that your STD testing Washington results will be accurate. You deserve the best and we provide that to all of our patients.